DataONEWebinar: Data management plans 2.0: Helping you manage your data from DataONE on Vimeo. Data management plans (DMPs) are becoming commonplace across the globe as a result of funders requiring them with grant proposals, but they are not being employed in ways that truly support the research enterprise. The current manifestation of a DMP—a static document often created before a project begins—only contributes to the perception that they are a useless administrative exercise. Conversations about the need for machine-actionable DMPs (also referenced as “active,” “dynamic,” or “machine-readable” DMPs) have been brewing for a few years. We still need a human-readable narrative, but there is now widespread recognition that, underneath, the DMP could have more thematic, machine-actionable richness with added value for all stakeholders: researchers, funders, repository managers, research administrators, data librarians, etc. The original DMPTool was launched in 2011 and has become a hugely popular resource among researchers and the research data management community as a hub of information about DMP requirements for US funders, especially the NSF and NIH. The webinar will introduce the new (just launched!) version of the DMPTool that represents a joint development effort with the Digital Curation Centre in the UK and other international partners. Now with a single, internationalized DMP infrastructure, our next steps will focus on piloting machine-actionable DMP use cases. This includes engaging with DataONE member nodes, the Research Data Alliance, and other community-driven initiatives. Our collective vision is to transform DMPs into a tool for better data management by embedding them into existing workflows and exchanging information between research tools and systems. This project is supported by an NSF EAGER grant awarded to the California Digital Library (Award no 1745675). Stephanie Simms is a Research Data Specialist at the California Digital Library and Product Manager for the DMPTool. In both roles she provides the 10 University of California campuses and beyond with technical, educational, and policy-related support for research data management and open scholarship initiatives. Her current focus is coordinating global efforts to transform data management plans from an annoying administrative exercise into a useful tool for researchers, funders, and other stakeholders by making them machine actionable. Prior to joining the CDL, Stephanie was a CLIR Postdoctoral Fellow at UCLA where she worked on geospatial data and data publishing projects. 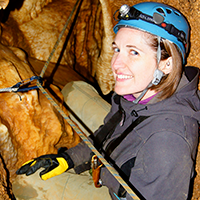 Her own archaeological research experiences involved plenty of challenges with managing and sharing myriad types of data, both physical and digital, and inform her current work. She holds a PhD in Archaeology and is a member of the DataONE Users Group and co-chair of the RDA Active DMPs Interest Group.